The Environmental Protection Agency of the Campania region in Italy (ARPAC) manages a groundwater quality monitoring network. For almost all the polluted waters, the key parameter driving the classification is the concentration of nitrate; hence, the Campania region, in coherence with the EU regulations, outlined the vulnerable areas and undertook remediation policies. The best groundwater quality is recorded for carbonate aquifers of the Apennine chain; on the contrary, the Tyrrhenian coastal plains are affected by severe contamination, with a locally very contaminated groundwater of the shallow and also the deeper aquifers. The study is especially focused on a large coastal plain of Campania region, where nitrate concentration sometimes exceeds 200 mg/L. The study, based on almost 200 sampling points for the whole region during the period 2003–2015 (approx two samples per year), verified the effectiveness of the groundwater monitoring network, the present distribution of nitrate in groundwater, and the evolution of nitrate trends at different scales: regional, groundwater body, and single well, using spatial and time series statistical approaches. Significant variations in contamination evolution within the study area have been observed and the correlation with land use has been highlighted. Nitrate contamination in groundwater is a worldwide problem (Burow et al. 2010; Capri et al. 2009; Su et al. 2013; Re et al. 2017). 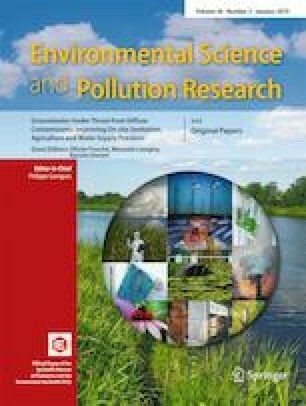 The excessive use of mineral and organic nitrogen fertilizers in agriculture has produced an increase and a diffusion of poor-quality groundwater in many regions of the world, constituting a hazard for the human health (Katsoulos et al. 2015). Indeed, when the amount of fertilizers exceeds the soil need, a significant part of N remains in the soil and it can contaminate the aquifers, especially the shallow aquifers. Nitrate contamination of groundwater bodies can also derive from other anthropogenic sources as animal manures, inefficient sewerage systems, and industrial wastewater (Nemčić-Jurec et al. 2007, 2013; Drake and Bauder 2005; Melian et al. 1999; US EPA 2000). Moreover, it should be mentioned a “cumulative effect,” e.g., the increasing use of livestock residues (liquid and semi-liquid manure) as fertilizers, which leach towards the subsoil through rainfall or irrigation (Baker 1992; Livingston and Cory 1998; De Simone and Howes 1998; Schilling and Wolter 2001; Liu et al. 2005). Burow et al. (2010) specify that already a concentration > 1 mg/L of NO3 is a sign of anthropogenic activity and 10 mg/L of NO3 is the maximum contaminant level (MCL) indicated by EPA to avoid the blue-baby syndrome in infants (Lord and Anthony 2002; Schroeder et al. 2004; van Grinsven et al. 2010; Erisman et al. 2011; Trivedi and Vediya 2012; U.S. EPA 2013). The Drinking Water Directive (Drinking Water Directive 1998) sets a maximum acceptable value (MAV) for nitrate of 50 mg/L, but the recommended limit value (RLV) is only 25 mg/L t and dry months was not found for (Nitrate Directive 1991). In Italy, the regulatory limit of nitrate concentration in drinking water is 50 mg/L as well (Decreto Legislativo 2 febbraio 2001, n. 31). The recommended threshold value to achieve the good standard of groundwater chemical quality for nitrate is 50 mg/L (Decreto Legislativo 16 marzo 2009, n. 30). Twenty-two percent of groundwater in agricultural areas in Europe exceeds the international regulatory limits for NO3 in drinking water (Sacco et al. 2007). Similarly, high concentrations have been found in the USA (Canter 1997), in China and Africa (Vitousek et al. 2009), in India (Gupta et al. 2011), in Denmark (Hansen et al. 2012), in Spain (Arauzo and Martínez-Bastida 2015), and in Italy (Fig. 1). The best policies in agriculture are definitely fertilizer use reduction, and many countries in the last 30 years legislated within this topic (Vitousek et al. 2009; Grizzetti et al. 2011; Hansen et al. 2010; Dalgaard et al. 2012). The EU’s Nitrate Directive (Nitrate Directive 1991) limits the application of fertilizers and nitrogen from farm manure. The guidelines, with the aim to reduce water pollution by limiting the application of nitrogen fertilizers and organic manures, provide (a) the water quality monitoring in relation to agriculture, (b) the designation of nitrate vulnerable zones, and (c) the establishment of (voluntary) codes of good agricultural practice and of (obligatory) measures to be implemented in action programs for nitrate vulnerable zones (NVZ). Nevertheless, taking into account the travel time of the fertilizers applied in the past and the capacity of the soil to retain the nitrogen compounds, we cannot expect a sudden reduction of the NO3 levels in groundwater. Moreover, the transit time of the transfer of the nitrogen compounds from the ground level to the groundwater table is not well known (Sebilo et al. 2013). The Campania region, object of this study, for the application of the EU’s Nitrate Directive legislated as follows: 2003: designation of NVZ; 2004: action program of Campania; 2007: new action program of Campania; 2010: application rules of the action program; 2013: re-designation of NVZ (Fig. 1). The study is aimed at the evaluation of the nitrate contamination in groundwater and in its evolution after the application of the Directive in the whole Campania region and especially focusing on a large coastal plain, the “Volturno-Regi Lagni” plain (P-VLTR), with intensive agriculture and high nitrate levels in groundwater since the 1990s. Further aim of the present study is to verify the spatial and temporal distribution of nitrate in groundwater at different scales: regional, groundwater body, and single well (Hansen et al. 2012; Kent and Landon 2013). The research also tested the use of spatial and time series statistical approaches for nitrate trend evaluation in groundwater to investigate the association between high nitrate concentrations and peculiar land uses. The Campania region (13,500 km2) is located in the southern part of the Italian peninsula and it shows at W a coastline along the Tyrrhenian Sea (Fig. 2). The region presents three main landscapes: the Apennine carbonate Mesozoic mountains, reaching elevations of more than 2000 m (about 32%), the alluvial and pyroclastic coastal plains of the rivers Garigliano, Volturno, and Sele (about 18%), and finally hills and valleys prevalently constituted by impervious sediments, but also with a small part represented by the Roccamonfina and Vesuvius volcanoes and pyroclastic hills of the Phlegrean Fields. The main land-use types of the region are agricultural areas (55.2%), forests and natural areas (37.3%), artificial areas (7.3%), and water and wet areas (0.2%) (source: http://annuario.isprambiente.it/entityada/basic/6139). The study especially focuses on the alluvial-pyroclastic plain of the Volturno river and Regi Lagni channel. In this plain, the prevailing land-use units, derived from the CORINE Land Cover inventory, distinguishing 44 classes of land cover in the European countries (CLC 2012), are arable land and permanent crops followed by urban areas that testify the high population density in this area (often > 250 inhabitant/km2). The study uses groundwater quality data from the monitoring activity of the environment protection Agency of Campania Region (ARPAC). The ARPAC since 2002 implemented the groundwater body (GWB) quality monitoring network aiming at the evaluation of the groundwater environmental state. In 2002, a comprehensive recognition of the data collected by the laboratories of the public health divisions in charge of water control (later joining ARPAC) has been carried out. So a preliminary classification of about 400 monitoring points, including wells and springs, has been achieved. In spite of the non-homogeneous data set, including data collected according to various requests, this recognition was the starting point for the creation of a first regional groundwater monitoring network. This first network started in autumn 2002 and included mostly perennial springs and major adduction wells feeding regional drinking water aqueducts, as well as some wells located in alluvial plains which had been already monitored by the ARPAC district laboratories. As a whole, the network consisted of about 120 monitoring sites. In 2002, the monitoring was carried out for 40 major regional GWBs. For each one, ARPAC defined the most significant sampling points (wells or springs), including also the most important water adduction sites of Campania region. The number of the sampling points increased progressively reaching 183 points for 46 GWBs in 2012. Starting in 2012, ARPAC carried out a widespread network revision with the main goal of monitoring further 34 GWBs, identified in the District Basin Management Plan of the River Basin Authority of Southern Apennines. Hence, new sampling points for these previously not monitored GWBs have been added, increasing also the sampling points for GWB in bad chemical status. The new monitoring network consists of 320 sampling points, mostly operational today. Groundwater of these points are sampled and analyzed each semester or, where needed, each trimester, in order to perform the annual chemical status classification, including the nitrate concentration evaluation, according to the Italian regulations (D.lgs. 30/2009 and D.M. Env. 6 July 2016). The sampling points, chosen also together with the River Basin Authorities, allowed the monitoring of the most important carbonate, volcanic, and alluvial aquifers of Campania (Fig. 2), which are the principal drinking water sources, as well as environmental crisis areas. The carbonate aquifers show hydrogeological features which endanger GW resources during drought periods, while the alluvial aquifers represent peculiar pollution risk areas. There are no sampling points in the mixed systems, because they are generally low permeable, with only few discontinuous aquifers of little consequence. The sampling points are owned by water resource managing companies or public administrations, only in case of lacking points private wells have been taken into account. Unfortunately, data about the depth of the screen of the wells of the monitoring network are few, but our knowledge on the area suggests that the majority of the wells (generally 25–30 m deep) are in the main aquifer, being the shallow aquifers only used for irrigation. The nitrate concentrations used for trend analysis are from sampling points in the study area selected on the basis of the availability of minimum 8 years of data (8–13 years) and with approximately two nitrate analyses per year. In 2015, the Campania region has been partitioned in 80 significant groundwater bodies (Fig. 2): 10% volcanic GWBs, 25% alluvial GWBs, 30% karstic GWBs, and 35% mixed, at low-moderate permeability. The main GWBs of the Campania region, with copious springs, are the carbonate mountains, which have a very high permeability due to a well-developed karstic network. The alluvial-pyroclastic GWB of the “Volturno-Regi Lagni” plain (P-VLTR) is the largest GWB of the Campania region, extending for 1035 km2. This GWB (Fig. 3) is constituted by porous aquifers, and it includes in the upper part shallow phreatic aquifers, not continuous, constituted by alluvial and pyroclastic deposits prevalently silty-sandy with low-moderate permeability (thickness 10–20 m). These deposits overlay a tuff, the Campanian Ignimbrite (39 ky B.P.) (maximum thickness: 50–60 m at the foot of the carbonate mountains, elsewhere 10–30 m), that acts for the aquifer below as a confining or semi-confining layer, depending on the welding conditions. The deposits below constitute the main aquifer, and they are sediments of marine, alluvial, and pyroclastic origin, prevalently coarse-grained sandy sediments, located at the bottom of the Campanian Ignimbrite. The range of transmissivity of this aquifer, with maximum thickness of 60–70 m, is about 1 × 10−3–1 × 10−4 m2/s. The velocity of filtration from the surface to the main aquifer is probably less than 0.1 m/day (Ducci and Onorati 1993) and the piezometric slope is very low (Fig. 3). This aquifer is delimitated at the bottom by clayey-sandy deposits, prevalently impermeable. Near the Volturno river, the tuffs are thin and there are peat levels formed in the palustrine environment, which determine low permeability and reducing condition. Alluvial and dune deposits prevalently sandy, with medium-high permeability, and with maximum thickness, near the sea, of 20 m, are parallel to the coastline (Corniello and Ducci 2014; Fig. 3). Close to the coast, only one phreatic aquifer is present and the potentiometric surface intersects the ground level causing potentially flooded areas, where the water is lowered by a pumping plant. The rain infiltration in the area is 200–300 mm/year, but there is also a recharge coming through a subsurface flow from carbonate and volcanic surrounding mountains (Corniello and Ducci 2014). The hydrogeochemistry of the area depends on the volcanic origin of the deposits and on the ongoing presence of active volcanism: often high contents of fluoride and arsenic of natural origin have been recorded (Ducci et al. 2016). Also the high levels of manganese and iron, especially along the Volturno river, are of natural origin, due to the presence of a reducing environment (Ducci et al. 2016). At the beginning of the new century, many wells of this area showed very high nitrate concentrations, exceeding, also in the deeper aquifer, 50 mg/L (up to 200 mg/L). Almost the whole P-VLTR groundwater body falls in the NVZs shown in Fig. 1. Nitrate contamination in groundwater is present everywhere, prevalently due to the farming and the buffaloes breeding, as revealed by isotopic studies carried out in a sector of the area (Corniello and Ducci 2014). The method used by ARPAC for groundwater sampling is described in the guidance on the sampling of groundwater for planning and undertaking groundwater sampling to survey the quality of groundwater, provided by the ISO 5667-11 (2009). The analytical method used by ARPAC is the method suggested in APAT CNR IRSA 2003, based on ISO 10304-2 (1995), Water quality—Determination of dissolved anions by liquid chromatography of ions—Part 1: Determination of bromide, chloride, fluoride, nitrate, nitrite, phosphate and sulfate, very similar to the updated ISO 10304-1 (2007), revised and confirmed in 2016. The instrument used is a Dionex (now Thermo-Fisher Scientifics) ion chromatography, with Thermo-Fisher Scientific Columns (AS23—4 × 250 mm), eluent: sodium carbonate/bicarbonate concentrate (4.5 and 0.8 mmol), and Dionex AERS 500 suppressor (4 mm for anion exchange). Instrument control, automation, and data processing have been performed using the CHROMELEON software ver. 7.0. Statistical approaches on nitrate datasets have been used to help identify which groundwater bodies are at risk (Chica-Olmo et al. 2014; Hansen et al. 2012; Kent and Landon 2013; Pardo-Igúzquiza et al. 2015) and which areas should be or remain designated as nitrate vulnerable zones. Descriptive statistics was done for all the data and it was compared to the recommended level value of EU’s Nitrate Directive (Nitrate Directive 1991). A significant difference between wet and dry months was not found for nitrate concentrations, so average nitrate concentrations in wells and in the groundwater bodies were calculated. Data from each year and location were averaged in order to determine the general water quality in a particular well due to nitrate. We used a set of data on NO3 concentration available in the two periods 2008–2011 and 2012–2015 for the groundwater bodies of Campania region, corresponding to the most important carbonate, volcanic, and alluvial aquifers of the region. The concentrations used in this study are the mean of the values measured during the observed period for each GWB, because it reflects the overall status of the GW body very well and its reflection of the status which is not exceeded in more than 50% of the area is fair to good (Grath et al. 2001). To investigate the spatial extent and variation of nitrate contamination, based on the data of the 16 sampling points in the groundwater body P-VLTR, a nitrate concentration map as difference between the two periods 2008–2011 and 2012–2015 was interpolated by the kriging method using the Surfer 11 software. A variogram was fitted with a linear function and a cell size of 800 m was used. The spatial correlation operation was used to investigate the spatial correlation between the point values (Babiker et al. 2004). The number of 16 sampling points can appear not statistically significant for the whole area, but data of more than 100 wells randomly sampled (Corniello and Ducci 2014) were considered and the results show a good agreement with the wells of the monitoring network. A summary statistics in 2003–2015 in P-VLTR is shown in Table 1. The nitrate trends of the time series (2003–2015) of nitrate concentrations in the P-VLTR groundwater monitoring points were performed by using three different approaches: (1) comparison of 4-year monitoring periods from 2008 to 2015, (2) nonparametric Mann-Kendall test (Mann 1945; Kendall 1975) with a confidence level of 95%, and (3) statistical trend analysis using the GWStat software (UE 2001, Annex 1 to Final Report). The first method was used in the Water Protection Plan of the Campania region (Regional Directive n.1220, 2007 and n. 56, 2013). The nonparametric Mann-Kendall test, which does not assume any “a priori” distribution for the data, is very powerful in identifying trends in the case of the environmental data especially for non-normally distributed datasets (Lee and Lee 2003; Kahya and Kalayci 2004; Zhang et al. 2005; AquaTerra 2004). GWStat software is very simple to apply: it assesses the chemical status of the groundwater bodies and successfully evaluates the presence of a trend of nitrate concentrations (UE 2001, Annex 1 to Final Report). Based on the results of the trend test, the changes in nitrate concentrations over time in the monitoring points were categorized as decreasing, increasing, and not detected trend. Similarly, nitrate concentrations in samples from the wells were categorized in five classes, considering in addition the class 37.5 mg/L indicated in the European Union’s Groundwater Daughter Directive (Directive 2006/118/EC 2006) as the starting points for trend reversal initiatives. Very high concentrations for nitrate are those greater than 50 mg/L, high concentrations are those 37.5 < NO3 ≤ 50 mg/L, and moderate concentrations are those 25 < NO3 ≤ 37.5 mg/L. Low concentrations are those 10 < NO3 ≤ 25 mg/L. Finally, very low concentrations are less than 10 mg/L. The concentrations are the mean of the values sampled during the observed period. In the period 2012–2015, nitrate concentrations in Campania groundwater bodies registered a maximum of 182 mg/L and the average nitrate concentration was about 17.5 mg/L similar to the average value of 16.4 mg/L in the previous period 2008–2011. High concentrations of nitrate occur infrequently in the study area but moderate concentrations are relatively widespread (Fig. 4). Only 7% of the Campania groundwater bodies had nitrate concentrations that are very high (NO3 > 50 mg/L), 7% are high (37.5 < NO3 ≤ 50 mg/L), 13% had moderate nitrate concentrations (25 < NO3 ≤ 37.5 mg/L), 25% had low nitrate concentrations (10 < NO3 ≤ 25 mg/L), and 48% had very low nitrate concentrations (NO3 ≤ 10 mg/L). The trend analysis showed that while in the groundwater bodies of carbonate aquifers the nitrate content is substantially constant (80% of the GWB), multiyear fluctuations affect prevalently the plains (Fig. 4). In the same period 2012–2015 in P-VLTR, the nitrate concentrations ranged from 0.2 to 126 mg/L and the average value was 49.1 mg/L, higher than the average value of 34.6 mg/L in the period 2008–2011. The 50% of the 16 measurement points had nitrate concentrations above the MAV, 12.5% had moderate concentrations, 12.5% had low values, and only 25% had very low nitrate concentrations (Fig. 5, Table 2). The comparison with the previous period 2008–2011 is presented in Fig. 6; the 75% of the measurement points had nitrate concentrations less than the average values in the period 2012–2015 and only the 25% of the wells had very high values. The different spatial evolution of the GWB is shown in the nitrate trend map (Fig. 7). This figure indicates that the changes in the nitrate concentrations over time are highest in the groundwater monitoring points at highest concentrations (see also Fig. 5). With reference to the time series (2003–2015) of nitrate concentrations in the P-VLTR monitoring points, the results achieved by using GWStat software and the Mann-Kendall test are quite comparable. The GWStat analysis of changes in concentrations over time in the 16 monitoring points showed that nitrate had not detected change in the majority of wells (56%), decreasing trends in about 25% of wells, and increasing trends in a relatively small proportion of wells (19%) (Fig. 8, Table 3). The percentage of wells showing increasing trends is higher (about 38%) for the Mann-Kendall test, while decreasing and not detected trends were observed in about one-third of wells (31%). In GWStat and the Mann-Kendall tests, wells with increasing trends for nitrate concentrations are located in the southern part of the GWB, as reflected in the previous described Fig. 7. Referring to the last years of the time series, from 2008 to 2015, the results of the comparison of the two periods 2008–2011 and 2012–2015 showed that nitrate had an increasing trend in the majority of wells (about 62%). This difference is due to nitrate concentrations calculated as the average over 4 years, so the trend analysis carried out comparing two periods of 4 years is very useful to confirm the spatial correlations abovementioned. Referring to the results of the comparison of the two periods 2008–2011 and 2012–2015, the largest number of upward nitrate trends (80%) is found in the southern part of the groundwater body, where the mean nitrate concentrations are highest (above 50 mg/L). The results of the analysis of regional- and local-scale nitrate concentration data indicate that at present, in the Campania region, almost half of the GWBs show a very high quality with respect to nitrate content, while only 7% of them are above the regulatory limits. The comparison with the previous 4 years (2008–2011) shows a similar result. These low levels of nitrate are prevalently due to the widespread presence of carbonate aquifers in mountainous areas without anthropic pressure (Imbrenda et al. 2012). On the contrary, the human activities are intensively developed in the flat areas prevalently with agricultural land-use and high population density. Nitrate levels in 2012–2015 are better correlated with the agricultural land use in 2006 (arable lands and permanent crops in CLC 2006) than in 2012 (CLC 2012) indicating a transit time longer than 1 year since the applications of fertilizers, as also pointed out by the values of velocity of filtration (§ 2.2—Ducci and Onorati 1993). Among these, the P-VLTR GWB, examined in detail, presents in the 4 years 2012–2015 a mean nitrate concentration very close to the law limit value of 50 mg/L, increased of 42% with respect to the previous 4 years (2008–2011). Figure 7 indicates that the changes in the nitrate concentrations over time are highest in the groundwater monitoring points at highest. Such correlation is in agreement with the results of Landon et al. (2011) that found that nitrate concentrations and increasing trends were correlated. Especially in the southern part of the GWB, where there are more urban settlements, the highest values of nitrate concentration and the highest percentage of increasing trends have been recorded. This increasing nitrate concentration in the southern sector does not reflect the effect of measures to reduce agricultural inputs of nitrate. In this sector, there are small parcels and often agricultural areas coexist with peri-urban areas (Corniello et al. 2007). The spatial statistical analysis carried out comparing two periods of 4 years highlighted these results, corroborating the statistical trend analysis of the single wells, carried out using all the values of the time series. The pattern of increasing nitrate concentrations through time in relatively deep wells should reflect the legacy of historical agricultural land use (Kent and Landon 2013). Indeed, for the application of the good agricultural practice code since 2004, we expected a decreasing trend in nitrate concentration. The scarcity of decreasing trends probably reflects still wrong and/or past agricultural practices, and is also due to the very low filtration velocity in the tuff and in the fine-grained pyroclastic deposits (Kim et al. 2006). Moreover, in the study area, settlements still exist with incomplete sewer coverage, outlying homes without sewerage system and treatment plants at low efficiency (PGA 2016). These circumstances can explain the findings in the present study where there seems to be consistency between high concentrations of nitrate in groundwater and the most pronounced nitrate trends in groundwater in P-VLTR. The available groundwater monitoring network data allowed the achievement of the above described important results about nitrate trend in groundwater. More available point data in the GWBs affected by severe nitrate contamination, as the P-VLTR GWB, should permit the control of the evolution in time and space of the contamination, giving the possibility of calibrated actions in agriculture practices and in land-use conversion. Indeed, a statistically sound evaluation of the nitrate concentration variations within a GWB in poor chemical status is a useful tool for targeted actions against pollution of portions of large vulnerable areas, choosing appropriately priority areas. Finally, this study seems to confirm for the whole region the possibility of a long-term arrival to the groundwater bodies of past applications of fertilizers in agriculture. Probably, in the near future, the levels of nitrate in groundwater will still decrease, and the study of the trends accounting on a longer series of data will contribute in the knowledge of the transit time between the ground level and groundwater in different hydrogeological contexts. We would like to thank the Editor Dr. Philippe Garrigues and the three anonymous reviewers for their constructive and helpful comments and suggestions, which allowed us to improve the presentation of the results of this study.